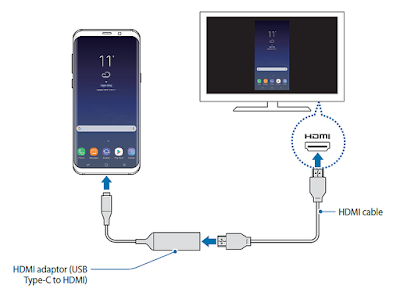 Samsung Dex Tutorials How to Connect Galaxy S8 to TV - Here our Galaxy S8 guide how to connect Galaxy S8 to TV using USB-C connector, Samsung DeX, HDMI Cable, Wi-Fi or Bluetooth. We know S8 support video out and the Samsung DeX is a service that allows you to use your smartphone like a computer by connecting the smartphone to an external display, such as a TV or monitor. You can use your Samsung Galaxy S8/ S8+’s features on a large screen conveniently by connecting an external display, keyboard, and mouse to feel the Galaxy S8 as a laptop or mini computer, but all accessories, including the DeX Station, Samsung Dock are sold separately. Connect one end of the HDMI cable to the DeX Station’s HDMI port, and plug the other end of the cable into a TV or monitor’s HDMI port. To use a wired network, connect the wired LAN to the wired LAN port. You can use your Samsung Galaxy S8/ S8+’s wireless data or a Wi-Fi network if you do not connect to the wired LAN. Press on the front of the cover to use the cover as a smartphone support. You can now see the smartphone connector. Be careful not to hurt your fingers when changing the angle of the smartphone support. Connect your smartphone’s multipurpose jack to the smartphone connector on the DeX Station. Samsung DeX will launch on the smartphone. You may not use the DeX Station if you have attached a certain type of case, such as a flip cover or a hard case cover to your smartphone. On your smartphone’s screen, select the screen mode you want to use. You can choose from Samsung DeX mode or screen mirroring mode. The screen mode you first select will be applied for subsequent connections on Galaxy S8 screen settings . To use Samsung DeX mode, connect a keyboard and mouse to the DeX Station’s USB ports. When you connect a keyboard, the virtual keyboard will not appear when you select the text input field. You can also use a wireless keyboard/mouse or Bluetooth keyboard/mouse for the respective Galaxy S8 Manual. Your smartphone’s screen will turn off and a virtual smartphone screen will appear on the connected TV or monitor. You can multitask by running multiple apps simultaneously. You can also check your smartphone’s notifications and status. If you want to control the Samsung DeX screen, you must connect a mouse. When starting or ending Samsung DeX, running apps may be closed. Some apps or features may not be available when using Samsung DeX. While using Samsung DeX, you can answer calls from your smartphone on the connected TV or monitor. Select the call answering option on the connected TV or monitor to answer a call. Your smartphone’s speaker will be used during the calls. If you do not want to use the speakerphone, remove your smartphone from the DeX Station. It may take a few seconds to display the call screen on the smartphone. Launch the Settings app and tap Connections → More connection settings → HDMI mode → Samsung DeX or Screen Mirroring. To disconnect your smartphone from the connected monitor, remove your smartphone from the DeX Station. 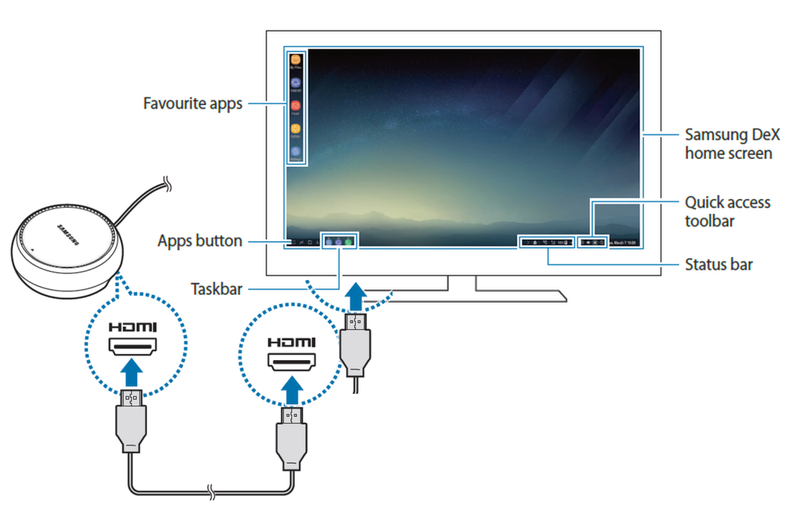 You can connect your smartphone to an external display, such as a TV or monitor, and view presentations or movies on the connected display. Connect your smartphone to an external display using an HDMI cable and HDMI adaptor (USB Type-C to HDMI). You can view your smartphone’s content on the connected screen. HDMI cables and adaptors (USB Type-C to HDMI) are sold separately. Use only a Samsung-approved HDMI adaptor (USB Type-C to HDMI). Performance problems and malfunctions caused by using unapproved accessories are not covered by the warranty. Connect an HDMI adaptor (USB Type-C to HDMI) to your smartphone. Connect an HDMI cable to the HDMI adaptor (USB Type-C to HDMI) and to a TV or monitor’s HDMI port. You can use the VGA adaptor (USB Type-C to VGA) for old TV or Monitor with VGA Port. The last connection settings Galaxy S8 to TV is use the Wi-Fi dongle or Bluetooth that smart connections with no wired.